Robbie Williams has revealed he would like to make sweet music with Noel Gallagher. Animosity between the two reached a peak in the 1990s, when the Oasis frontman branded the Angels singer "the fat dancer in Take That", to which Robbie retaliated by calling Noel "a mean-spirited dwarf". But it appears that Robbie would like to extend an olive branch and put their long-suffering feud behind him, writing on his blog: "I know it's pretty redundant but I'd love to write with Noel Gallagher." He also posted the music video to Noel's single The Death Of You And Me, from his upcoming debut album High Flying Birds, with the caption 'Tune'. 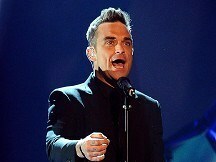 Robbie, currently touring Europe with Take That, also spoke highly of Janelle Monae. "Go check the whole concept. She's come up with where it's at. Me thinks. Inspiring and unique," he wrote.